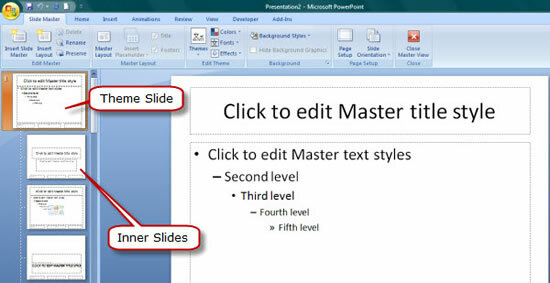 There are four levels to use PowerPoint templates. It is the primary level. You just open or new a new PowerPoint presentation. The default background is white without any images or decorations. It is dull, not colorful, not attractive. The second level is to use the templates come with Office Suite which contains PowerPoint. The number of such templates is limited. Most people choose to use these defaulted templates, who may do not care much about the layout of their presentations. Therefore, you should view many presentations with the same standard templates in all kinds of symposiums, meetings, forums and conferences. It is not attractive enough and can be outstanding out there. You may want to be different with the ones who use the defaulted templates in PowerPoint. Hence, you use some downloaded the stock ones from Microsoft Office Online or some other free or paid PowerPoint templates providers. Still, it would take you much time to download and select a proper template for your purpose or subject. Last, as you want to make a presentation with your own style or with your own brand, you may want to apply special background using your own image for your PowerPoint presentation. The benefits of your own design far outweigh the cost of time to choose or buy a proper one. How to Brand PowerPoint Slide Shows by Customizing Template? You can customize your own templates bases on Level 1 from a blank template, or Level 2 from a standard template, or Level 3 from a stock template. I would take the first choice which is based on a blank template in this tutorial. Open or New a PowerPoint presentation. A new tab and window names Slide Master would display for you to design the slide master. There is one theme slide on the most top. You are allowed to adjust the font, font size and the font color here. There are also some other inner slides. A one named Title Slide Layout which is going to be our template for the first slide. Another one named Title and Content Layout which is going to be the template for the inner slides. There two are most commonly used layouts. You can follow the steps below to customize the background of them. Click Background Style and choose Format Background. A new window would pop up for you to customize the background. 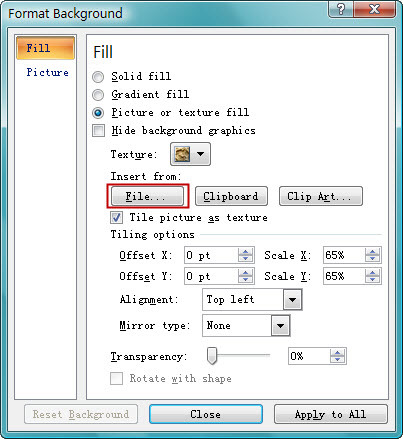 Choose the third choice Picture or texture fill and then click File… to browse and locate the picture you want to add as the background image. In order to make an appropriate background, you need to adjust the picture size and aspect ratio to the same as your presentation. You may need to experiment a little. You can set different background for the title slide or the inner slides. Or else, you can click Apply to All to slide layout. You can also adjust the Transparency by dragging the slide bar to the value you like. Besides adding background image for your whole inner slides or the title slide. You can also browse and find other GIF or other small vivid clip-art or other accessories to decorate the template. You just copy it and then paste it to the Title and Content Layout. You can also drag it using mouse to any where you want. You can also change the properties by double clicking the accessories. You can also add company logo or Web site URL to your Content Layout. Here below a sample screenshot. Done! Close the slide master window to get back to the editing mode. Save File As .POTX (or .POT in 2003) which is how templates are saved in PowerPoint. 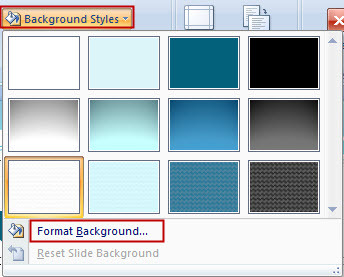 This solution is also the guide you can follow to change the background of your PowerPoint template. And if you want to just change the background of a certain slide, you can customize the background from main menu Design -> Background Style to format the background. You can also click Apply to All to set the picture as the background for whole slide show. 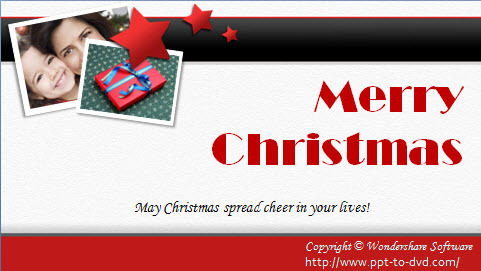 You can go to free PowerPoint templates resources page to get some ideas.